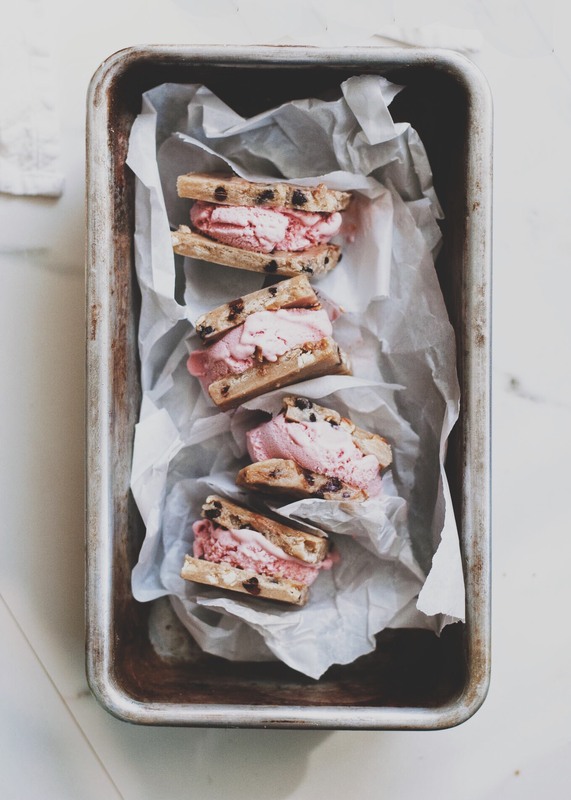 Continuing right along in our quest for no bake desserts and treats that help you keep your chill in ridiculous summer heatwaves… these Pretzel & Chocolate Chip Cookie Dough Ice Cream Sandwiches are going to be your new summer favourite for sunny day snacking, and a quick throw together option with pretty minimal prep work for dessert post barbecue dinner. The buttery cookie dough, with it’s salty, crunchy, chocolaty bits strewn throughout, is smooshed down around my favourite tangy lemon ice cream, hugging it into submission and creating optimal mouth happiness. 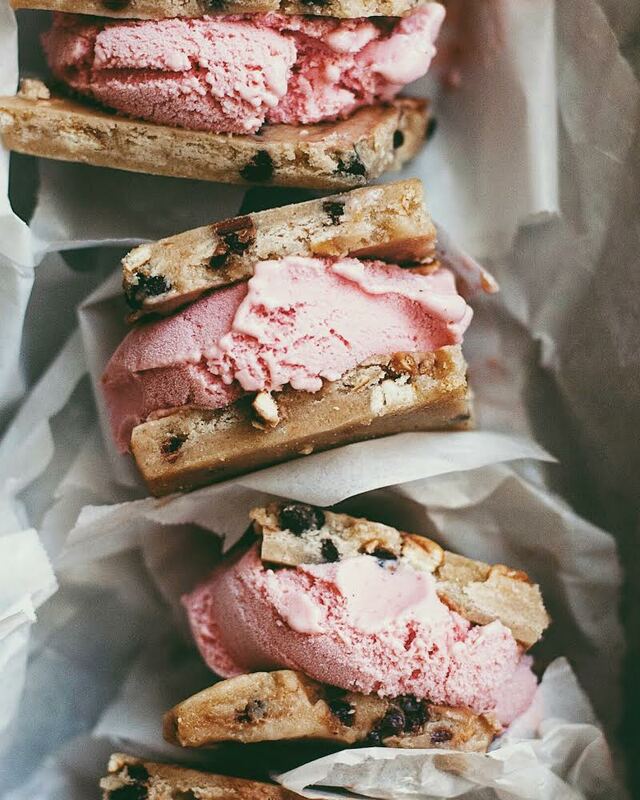 They are the type of ice cream sandwich that brings you back to childhood. Because the dough is raw (but egg-free, don’t fret), it doesn’t harden like a typical baked cookie would, meaning when you bite down into your ice cream sandwich, the ice cream isn’t going to ooze out the sides as you try your damnedest to bite through that hard cookie shell – you know what I’m talking about. The texture of the ice cream and the cookie dough are both soft and easy to bite into, making for the perfect bite every time. If pretzels aren’t your thing, no biggie! Leave those suckers out. If you prefer white chocolate or dark chocolate chunks, switch it up! Not down with lemon ice cream? Ain’t no thing – use something else (we love these with strawberry ice cream, too). The beauty is in how flexible this recipe is, and how you can adapt it to suit your own tastes. My initial thought was to do an oreo cookie dough, and I still think that would have been killer. I haven’t tried this with coconut oil in place of butter in the cookies, which would make them vegan, but I am almost certain it would be delicious and add another level of great flavour. My only concern with vegan ice cream is it doesn’t always harden as much as real cream so it may melt out the sides more easily when you bite into the sandwich. All in all, these are simple to make, pretty to look at and sure to make mouths happy when the mercury rises (and when it doesn’t). Enjoy! 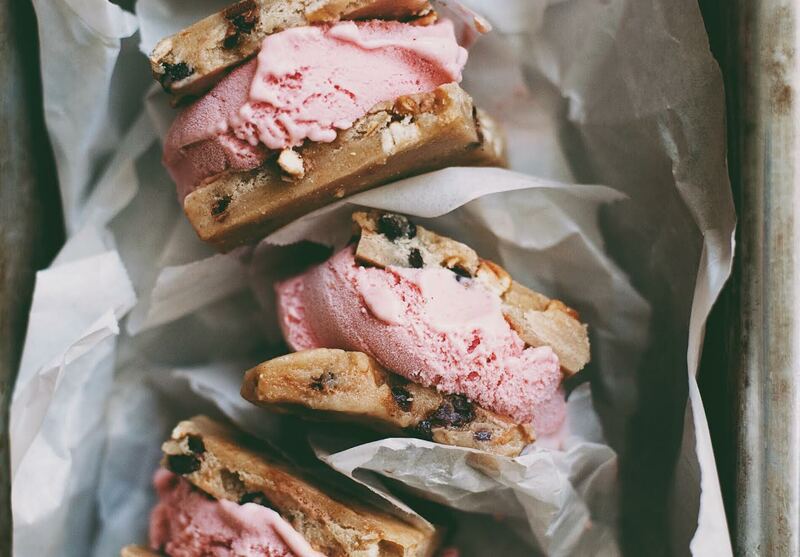 Soft cookie dough ice cream sandwiches that will bring you right back to childhood. In a large bowl, cream together the butter and sugar. Add the milk and vanilla extract and stir well. Whisk together the flour and salt and add to the wet ingredients, mixing with a wooden spoon until everything is combined. Fold in the chocolate chips and pretzel pieces. Pat or roll the cookie dough out into a rectangle about 1/2″ thick. Place on a cookie sheet and freeze overnight. Thirty minutes before youre ready to assemble your cookies, remove the ice cream from the freeze to soften a little. Place the rectangle horizontal in front of you and place ice cream onto one half of the cookie dough. Method #1: Use a sharp knife to cut the other side of the cookie off and place it on top of the ice cream, pressing gently to smoosh and get any air bubbles or holes out. Dont press so hard that the softened ice cream oozes out, though. Method #2: Cut the frozen cookie dough into 2″ x 2″ squares, place 1-2 tbsp of ice cream in between 2 cookies and press together gently until ice cream comes to the edges. Freeze the whole thing for 4 hours or overnight.